Toxin which inhibits agonist-induced platelet aggregation, the self-adhesion of platelets via adhesion molecules. Numerous snake venom families are able to inhibit platelet aggregation by enzymatic and non-enzymatic mechanisms. Enzymatic protein families include metalloproteinases, phospholipases A2, nucleotide pyrophosphatases/phosphodiesterases, 5'-nucleotidases and L-amino-acid oxidases, while non-enzymatic protein families include Snaclecs, disintegrins and snake three-finger toxins. One protein of the natriuretic peptide family has also been described to inhibit platelet aggregation. Figure 1: Different platelet receptors and their ligands. These molecules are the targets of venom proteins that inhibit platelet aggregation (see text for more details). - von Willebrand Factor (vWF) is a large glycoprotein that is released from endothelial cells in blood plasma as well as from platelets. Under high shear stress conditions, it promotes adhesion of platelets to the sites of vascular injury by forming a molecular bridge between sub-endothelial collagen matrix and platelet-surface receptor complex GPIb-V-IX. It also acts as a chaperone for coagulation factor VIII (F8), delivering it to the site of injury, stabilizing its heterodimeric structure and protecting it from premature clearance from plasma (Swieringa et al., 2014 ). - Thrombin is the main effector of the coagulation cascade that induces fibrin clot formation, as well as a strong platelet agonist. It activates platelets by cleaving the protease-activated receptors (PAR) (Mackman, 2008 ). - Integrin αIIbβ3 (ITGA2B/ITGB3) is the most abundantly expressed receptor on platelets. On resting platelets this integrin assumes a bent form with low ligand affinity. 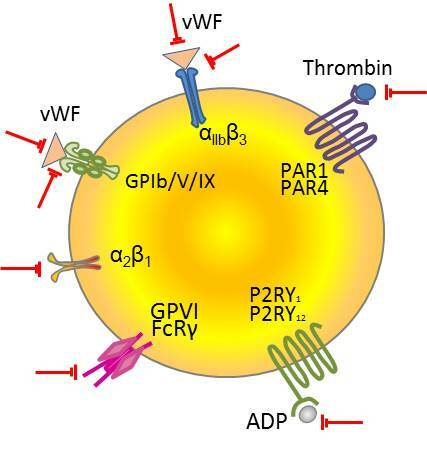 When platelets are activated, it shows high affinity for fibrinogen, vWF, fibronectin, and vitronectin (Swieringa et al., 2014 ). - GPIb (GP1BA) is a component of the GPIb-V-IX complex. This complex binds vWF (A1 domain), allowing platelet adhesion and platelet plug formation at sites of vascular injury. GPIb is composed of two disulfide-linked GPIbβ subunits that are non covalently linked to one GPIbα subunit. - Integrin α2/β1 (ITGA2/ITGB1) is a receptor for collagen, and its function depends on conformational changes. Its activation depends on cytoskeleton-mediated kindlin-3 and talin-1 interactions. It is responsible for adhesion of platelets and other cells to collagens, modulation of collagen and collagenase gene expression (Nieswandt et al., 2009, Swieringa et al., 2014 ). - Platelet glycoprotein VI (GPVI or GP6) is the principal signaling receptor for collagen on platelets. It is a member of the immunoglobulin superfamily, which associates with the ITAM-bearing FcRγ-chain. GPVI is only expressed on platelets and megakaryocytes. Stimulation via GPVI leads to full platelet activation, including integrin activation, secretion and procoagulant activity (Swieringa et al., 2014 ). The table below shows the different platelet receptors and receptor activators, as well as the families of venom proteins that impair them.